Tucked between Rockaway Township's town of Hibernia and Split Rock Reservoir lies a large portion of Wildcat Ridge Wildlife Management Area, one of New Jersey's many multi-use WMAs. Throughout the state, these tracts of land have been set aside for a variety of public uses including hiking, nature study, photography, exploration, fishing and hunting. Wildcat Ridge WMA also offers a great opportunity to delve into the area's history, some of which might be surprising and unexpected. A forgotten cemetery high above today’s Hibernia. 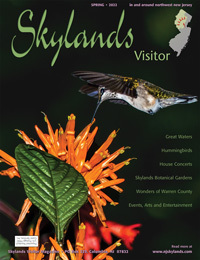 Wildcat Ridge contains nearly 4,000 acres in Morris County, an area of the state that has had its share of development. At first, the thickly wooded land within this WMA reveals only a minimal amount of the human touch. But appearances can be deceiving, the first clue being that most of the trees here are less than 60 years old. Years ago, much of Wildcat Ridge showed the intense scarring caused by large-scale mining operations working to extract their share of a very large, productive vein of iron ore underlying this area. Nature has successfully reclaimed the land; trees have grown back, streams again flow unaltered, and even some of the grossly disfiguring mining remnants have been incorporated into nature's altered plan. Today, lovers of nature, history, and geology will all find something here, laced with a bit of intrigue. Hikers will find miles trails–blazed and unblazed–and old woods roads running maze-like through most of the WMA. 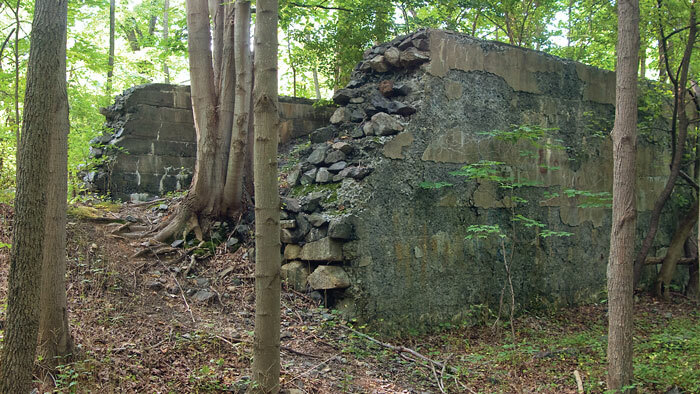 A hike here makes you feel as if these woods never felt the effect of a disruptive human hand, but occasional reminders of past mining still remain in the form of a foundation here, an old wall there, long shallow trenches, and overgrown old roads. You'll find a wide variety of plant life in the scattered boggy areas, along rocky outcrops, in old fields, and throughout the thick woods. Sharing this area with you will be some of New Jersey's typical wildlife such as squirrels, turkeys, and deer. If you're lucky you might also see more unusual inhabitants such as porcupines, otters, bears, and even bobcats. And make sure you keep an eye out for timber rattlers which also live here. Beyond that, Wildcat Ridge boasts a beaver pond, a hawk watch, and a bat cave! Wildcat Ridge Hawkwatch can be accessed by parking in the gravel lot at the southern end of North Hibernia Road, walking a short distance to the Orange Trail and then following it easterly for less than a mile to a rocky overlook. Established in 1997 as an official Hawk Migration Assoc. of North America (HMANA) site, it is manned by volunteers during the spring and fall hawk migrations. During those weeks it is possible to catch sight of as many as 16 different species of hawks. 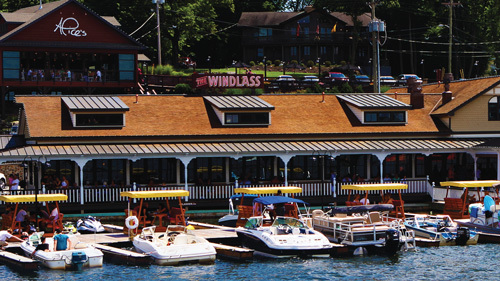 Offering an amazing view of the mountains and valleys to the east, on a clear day you may even catch a glimpse of the NYC skyline. The bat cave near the lower Hibernia Road parking area. Until their population was decimated by the white nose fungus in recent years, it was possible to see large numbers of bats from an observation deck located at the southwestern base of the mountain, near the town of Hibernia. The platform, which keeps observers at a safe distance yet close enough for a good view, faces a large mine opening in the mountain that people frequently mistaken for a cave. 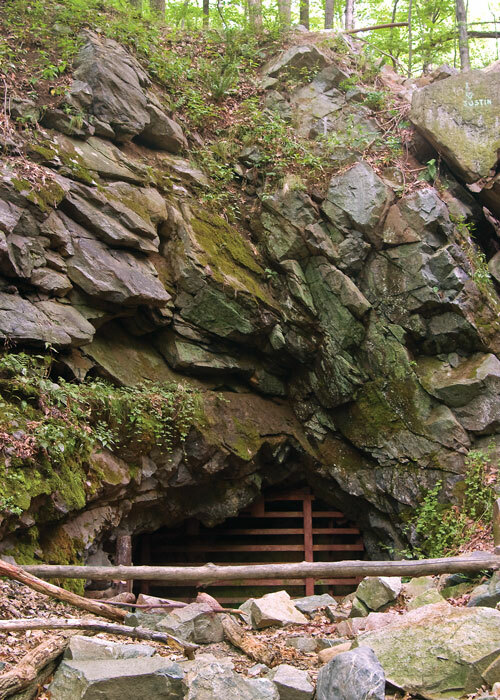 New Jersey's largest known bat hibernaculum, estimates are that up to 26,000 little brown bats once used this former mine as a shelter, hibernating here during the winter since at least the 1930s. Today's impressive bat shelter is the former Andover mine tunnel (not the same as Sussex County's Andover mine), going back thousands of feet into the mountain. A few years ago this entrance was partially sealed so that people are kept out while the bats have easy ingress and egress of the tunnel. As you approach the area of the mine's entrance, depending on the current temperature and humidity, you may notice a fog or mist emanating mysteriously from its mouth. Or sometimes, even from hundreds of feet away, you can feel the cold draft blowing out of the mine. A large beaver pond is situated a short distance from the first parking area near the end of Upper Hibernia Road. By following a red-blazed trail eastward, you will reach a large pond on the left. Depending on whether high waters from storms have broken through the dam or beavers have built it up again, the appearance of this pond will change from time to time. At least two active beaver lodges have been observed here. Utilizing unmarked old wagon roads, faint unmarked trails or newer blazed trails, hikers will encounter walking paths covering most of the area. Blazed trails include the white-marked Four Birds Trail, the short red-blazed beaver pond trail, and the Orange Trail. The Orange Trail, accessed from a parking area at the end of Upper Hibernia Road, is less than a mile long. Many hawk watchers follow this trail to reach the Wildcat Ridge Hawkwatch located at its eastern end. The longest marked path is the 19-mile-long Four Birds Trail. Blazed with white, it threads its way through this WMA, passing by historic remnants as it continues northward into Farney State Park. Opened in 1996, the southern trailhead is at a gravel parking area on Lower Hibernia Road a short distance from its intersection with Green Pond Road (Rt. 513). If you prefer less established trails, at least two or three unmarked old roads pass through the woods. As you walk these roads, now narrowed by overgrowth, try to picture the former horse and wagon travelers who once depended on them to get back and forth. If you hike here when the foliage and undergrowth are thick, it may seem as if this area has been largely untouched by people. But there is a different impression if you visit when visibility is better. Scattered nearly everywhere along the old road connecting the present Upper and Lower Hibernia Roads are remnants and traces of old foundations and cellar holes, abandoned lanes and woods roads. But it's the trenches, the abundant rock piles, and the pits that leave the best clues that mining happened here, and lots of it. This historical map shows the Hibernia mining sites, many of which are quite evident at Wildcat Ridge. Iron Mines & Mining in New Jersey, Geological Survey of New Jersey, Vol. VII., by William S.Bayley, 1910. Along this old road was a collection of mines now called the Hibernia Mine, a misnomer since at least a dozen shafts were sunk here by nearly a dozen different mining companies. At first the mines were individually-owned tracts, each company of miners working the same rich vein of iron ore that runs deep under the mountain for a mile or more. 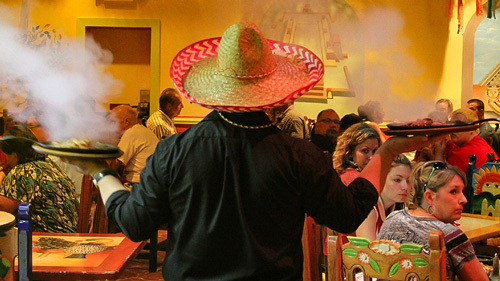 Over the years, one by one, the tracts were consolidated into larger but fewer operations. Eventually the Andover tunnel at the base of the mountain, today's bat hibernaculum, was driven so far into the mountain that it connected with most of the shafts. Standing on this ground today it is hard to imagine that the deepest shaft went down 2600 feet and that somewhere in the rock below you are 26 mine levels! 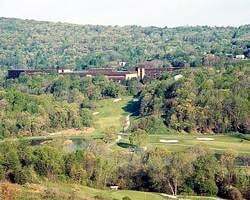 The Hibernia mine, one of the most productive iron mines in New Jersey, had its own railroad, the Hibernia Mine Railroad, the only incorporated mine railway in New Jersey. It was used to transport ore from the mines here to the Morris Canal and larger railways a few miles south in the town of Rockaway. Mining ruins along an old road that runs through the former Hibernia mines. Although due caution is advised when heading off the trail in this area, most of the shafts have been filled in, at least partially. Although you might not locate the old shafts, finding traces of the many ancillary structures is fairly easy. Scattered across the top, sides and base of the mountain are many old foundations and ruins, some of them very large and still impressive even in their deteriorated condition. At one time a few hundred miners were employed to work the tunnel and shafts at Hibernia. Even though very little remains of their former community on top of the mountain, at one time there were dozens of dwellings, a large school, a couple of saloons, and even a hotel. Based on the pattern of houses shown on old maps, they were probably built by the mining companies to house their workers. Today, looking around the barren and wooded areas up here, it's hard to imagine that any sort of village ever existed. A good indication of the former village's size is the number of school age children it had. In 1867, when the Upper Hibernia school district was created, it was large enough to warrant hiring both a principal and an assistant teacher, while many other surrounding school districts had only a teacher. In the 1880s, today's town of Hibernia was the Lower Hibernia school district and the mining village that was once located on top of the mountain was designated as the Upper Hibernia district. Nearly all of the dwellings of the upper district were intermingled with the mines and their associated structures. The 1880 Census shows that the mountaintop village had 740 residents. In comparison, the town of Rockaway had 1,052 residents at the time, only slightly larger than the lost mining village. Not far off the old mining road lies one of the most surprising clues hinting at the size of the village's former population. 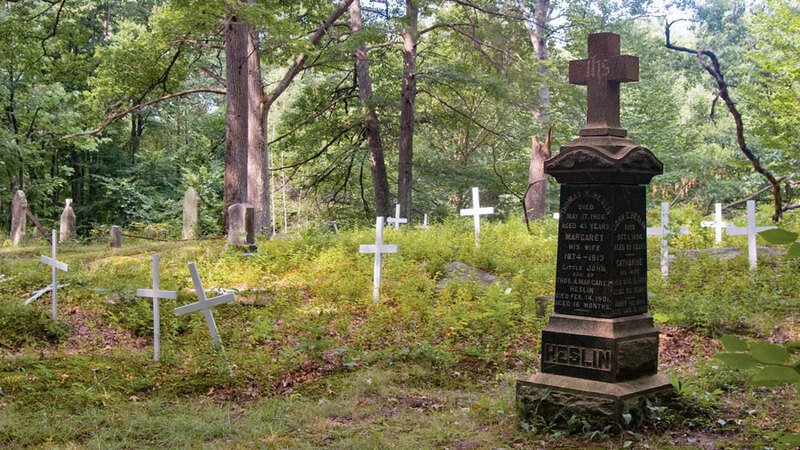 A large cemetery lies in the woods, deep in the middle of nowhere. Spotting it on new topographic maps almost makes it seem as if the mapmakers made some mistake, especially if you are familiar with this remote area. It is on the mountain high above today's Hibernia. Why would anyone ever put a large cemetery way up there, away from the town? Perhaps a visit to the site will verify that the cemetery exists there yet today. A couple of signs hanging near the front of the cemetery declare the sacred ground to be “St. Patrick's Cemetery”, established in 1869. 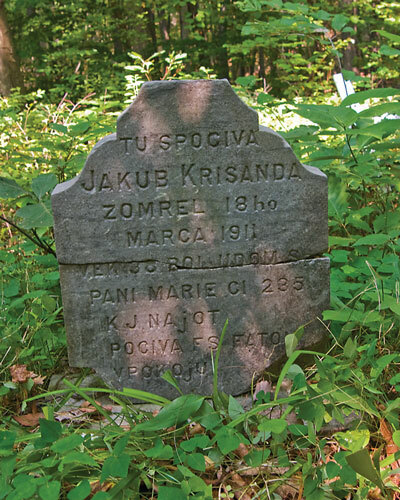 A gravestone indicates eastern European ancestry in the vanished village. Heavily vandalized over the years, exploration of this rather large cemetery reveals one of its most interesting features. A large percentage of the remaining gravestones memorialize what appear to be eastern European names. Even the text, which is carefully carved on the stones, is of that ethnic language. So why is this forgotten cemetery all the way up here? Because, back then when the cemetery was being used, it was near the lost and forgotten dwellings of the former mining village; the one that once existed amidst the mines not far away. As surprising as it is to discover the cemetery hidden in the woods, it is even more remarkable to look at other old maps and see a Roman Catholic Church located near the mountain top in an area that today leaves scant signs as to its existence. Nevertheless, evidence suggests that it indeed stood somewhere up here to serve the spiritual needs of the miners and familes. It was called “St. Patrick's Roman Catholic Church” and was most certainly associated with the cemetery of the same name a few hundred yards away. Because of the ever present dangers of mining, the citizens of the vanished town needed frequent spiritual consolation. Even a brief search of old records shows that death was a regular event at the Hibernia mines. Today, some might lament the effect the Hibernia mining operations had on the land. Large areas of the earth's surface were torn up so that huge amounts of iron-bearing rock could be removed and put through the dirty work of mineral removal and processing, polluting air and water. Imposing piles of waste rock still characterize the landscape, and open shafts remained hazards for years. But neither history nor nature like imbalances, and the mines' evolving effects have found a way to turn positive. Had the mine owners not retained their huge tracts of land for so many years, chances are good that subdivision and ensuing development would have taken place. Future development of this WMA seems unlikely, ensuring that the public will have a place in which to get out in nature; a place for the beavers to build their dams and lodges; a place where groups of hawk watchers can gather to admire the surrounding “wilderness” while waiting for the next flight of hawks; and a large subterranean home for thousands of bats. Due to the net-like maze of trails and old roads here, many of which may be faint and unmarked, it is a good idea to carry at least a simple trail map of the area. Even finding the parking areas may be challenging, depending on which maps you use. A GPS or compass will ensure that you won’t become disoriented. Wear sturdy boots and bring a hiking stick to help navigate the rocky terrain. Don’t forget water and trail snacks to enjoy along the way. From the Exit 37 overpass of Interstate 80, drive 2.8 miles north on Green Pond Road to Lower Hibernia Road on the right (east). Be aware that some maps call this road Lower Hibernia Road, others call it Sunnyside Road, other maps just leave it unnamed. Whatever it may be called today, not long ago it was still known as Lower Hibernia Road. Since this road may be unmarked look for it about 1200 feet north of Dudak Road which will be on your left as you pass it. Once located, turn right onto Lower Hibernia Road and almost immediately look for and turn into the gravel parking area on the left. When the foliage is thick the entrance to this lot may be easily missed. Park here for the Four Birds Trail’s southern trailhead, the trail to the bat hibernaculum, and access to the area in general via a steep rocky old road heading up the mountain. The observation deck for the bat mine is about 800 feet from this parking area via the white-blazed Four Birds trail for the first 450 feet. When the white trail bears left, continue straight up the slope. Continue upward for about 150 feet, looking for a level trail that bears off to the left. The observation platform will be about 200 feet down this trail, about 100 feet before the large opening of the bat mine. The steep rocky old road heading up the mountain beyond the turnoff for the bat mine will pass through the main former mining area and will connect with Upper Hibernia Road and its parking areas about a mile away. Upper Hibernia Road is usually well marked on most maps. To access the parking areas located at its southern end, continue on Green Pond Road 3.6 miles beyond Lower Hibernia Road (6.4 miles from the I-80 overpass) to Upper Hibernia Road on the right. Turn right onto Upper Hibernia Road and drive 2.5 miles to the first parking area or 0.2 miles further for the second parking area, both gravel lots. The Orange Trail to the Wildcat Ridge Hawkwatch starts just beyond the southeastern corner of the second parking area. Look for a gated old road heading easterly for this trailhead. Continuing southwesterly on foot beyond the barrier at the end of Upper Hibernia Road leads directly through all the former areas of mining. Along this old road you will encounter various side trails to explore, some of which are marked, many of which are not marked.